In this EFT tapping video, Dawson Church, PhD offers a tap along for healing fears from natural disasters like the earthquake in Nepal, Hurricane Katrina, Hurricane Sandy, flash floods, and Typhoons. If you or a loved one are fearful in the wake of a natural disaster like the earthquake in Nepal, please tap along with Dawson in this 10 minute video to release some of the most common fears related to natural disasters. One of the most profound discoveries in EFT in the early part of the twenty-first century was the phenomenon called "Borrowing Benefits." It's the discovery that simply watching someone else do EFT on their issues, while tapping along with them, can help you reducing the emotional intensity of your own issues. Borrowing Benefits was first noted by EFT practitioners. They reported that, rather than feeling exhausted after a day working with clients, they were energized. Their own emotional problems seemed to have melted away, even though they weren't working on the same issues as their clients. 1. Pick an issue you'd like to work on. Write down a brief name for the issue in 1 to 3 words. 2. Rate your degree of emotional distress on a scale from 0 to 10, with 0 being no intensity and 10 being the maximum intensity. Write down your number. 3. Identify a part of your body in which you feel the sensation associated with that number, and write down the name of that particular body location. 4. Recall an event in your life when you felt that feeling in your body. Pick the event that occurred the earliest in your life, if possible. 5. 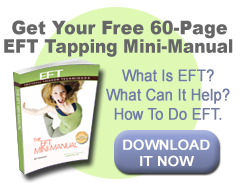 Start tapping through the EFT points, as soon as the video session starts, and keep tapping till the end. When the person onscreen states their issue, state your issue instead. 6. When the video is done, usually in 5 to 20 minutes, think about the issue, tune into that same part of your body, and rate your degree of emotional distress a second time. Write down your new number. You'll usually find your number dropping substantially. If it doesn't, then pick another specific incident in your life most identified with that feeling in your body, and repeat the process.